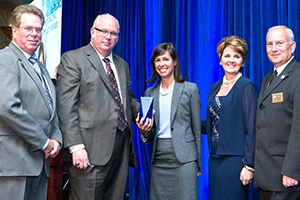 2013 Leaders in Policy Honored by APCO at Awards Dinner in Washington, D.C. 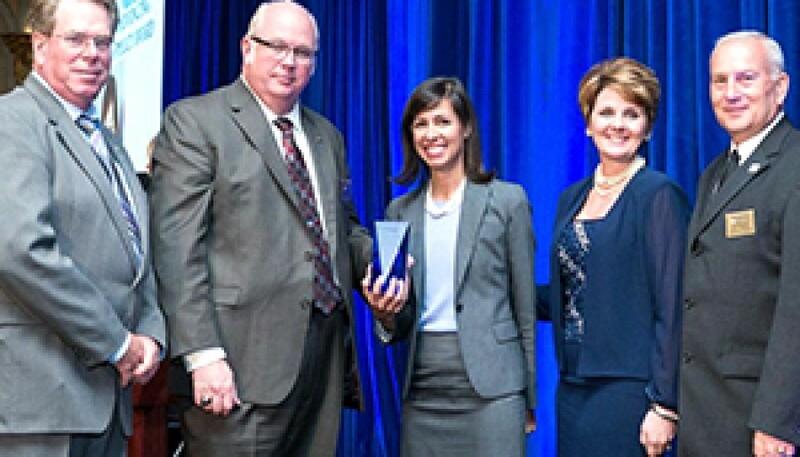 The Executive Committee presented FCC Commissioner Jessica Rosenworcel (center) with the Leadership in Advancing Communications Policy Award. On the evening of May 14, APCO International held its 9th Annual Public Safety Communications Leadership in Policy Awards Dinner at the Renaissance Mayflower Hotel in Washington, DC. The elegant evening began with a reception sponsored by AT&T at 6 p.m. and was followed by a seated dinner. The APCO Executive Committee – President Hall, First Vice President Gigi Smith, Second Vice President John Wright, and Immediate Past President Gregg Riddle — joined each awardee on the stage. They presented the first award of the evening to Sheriff Paul H. Fitzgerald for Leadership in Advocacy. Unfortunately Sheriff Fitzgerald was unable to attend and Dave Weisz with Motorola Solutions accepted the award on his behalf. Sheriff Fitzgerald was given the award for providing exemplary guidance on public safety communications issues of concern from local to national levels. He was a key player in the efforts of the Public Safety Alliance to enact legislation that secured the D Block and he is a current member of the FirstNet Board. The next award presented by the Executive Committee was to Congresswoman Anna G. Eshoo with the Leadership in Legislative Services Award. Representative Eshoo was recognized for her dedication and hard work in leading the charge to producing significant technology advancements in wireless 9-1-1 service and VoIP 9-1-1. Representative Eshoo thanked the audience for their support and said that she looked forward to continuing to work with APCO on these important issues. Following dinner, the awards presentation continued with Kenneth Moran, Senior Deputy Chief of the FCC’s Public Safety and Homeland Security Bureau, accepting the award for Leadership in Regulatory Service. Moran is credited with developing and continually improving the FCC’s response to natural and man-made disasters and his dedication has made a real difference in the safety and security of our communications systems. The final award presented by the Executive Committee was given to FCC Commissioner Jessica Rosenworcel for Leadership in Advancing Communications Policy. Commissioner Rosenworcel has served in various legal advisory positions for the Wireless Competition Bureau and the U.S. Senate Committee on Commerce, Science and Transportation. Rosenworcel’s enthusiasm was felt around the room as she spoke about her monthly visits to PSAPs all over the country and what is was like to get a first-hand look at the current status of our industry. She thanked the audience and applauded APCO’s work toward securing a nationwide interoperable public safety broadband network. Following the award presentations, President Hall discussed how he was encouraged by the broadband access and other innovations that the awardees are helping bring to fruition as they will ultimately usher in an era of boundless communications. He concluded the program and invited attendees to end the festivities on a sweet note with a dessert bar and coffee. Of course, the dinner would not be possible without the support of its patrons, supporters and corporate partners. A portion of the proceeds go to the furtherance of the Public Safety Foundation of America.